Watertown, Massachusetts is an ideal community for people who enjoy outdoor exploration and exercise with their dogs. 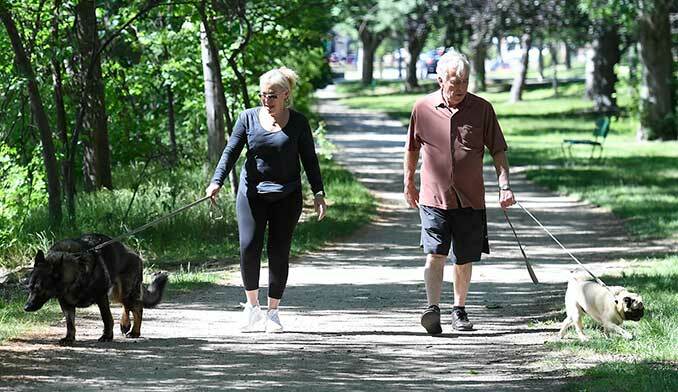 The town is home to an off-leash dog park, as well as several designated recreational areas where people may walk with their on-leash dogs. Centrally-located in the Commonwealth, Watertown also features several unique and historic sites, such as Mount Auburn Cemetery, founded in 1831 and designated as the second oldest public garden in the United States. Other interesting facts about Watertown’s history are available on Did You Know page of the Town’s website. This article is a guide for Watertown residents to learn where they may walk or run locally with their dogs, and to discover resources for a variety of dog care services. Watertown requires that all dogs and cats in the town are licensed, and maintain current rabies vaccination. Licenses and renewals are issued by the Town Clerk, and are valid from January 1 through December 31 each year. Visit the town’s Dog/Cat Licenses web page for a fee schedule and link to the license application. The Health Department’s Animal Control web page provides information about the Town’s Animal Control program and how to find or report a lost pet. The Health Department also produces a brochure titled Responsible Dog Ownership in Watertown, which details the state laws and municipal ordinances relating to dogs, and other helpful information. Town-owned; use is restricted to Watertown residents only. Features: This dog park is completely fenced-in, and features a large run area for off leash dogs. Other amenities include benches, water, and bags for dog waste. Features: Fenced-in dog park and play area. This area is privately-owned, and subject to the owner’s rules. Provision A: No dog shall be allowed on school property, in cemeteries, or in public parks maintained by the town. Service animals are exempt from this provision. Provision B: Notwithstanding the provisions of division (A) above, dogs on leashes shall be permitted on marked or paved walking paths on Whitney Hill Park, Saltonstall Park, Arsenal Park, Linear Park, Filippello Park, Howe Park and the park behind 552 Main Street, exclusive of athletic tracks and tot lot surfaces. Provision C: Notwithstanding the provisions of division (A) and (B), dogs shall be permitted inside town-designated dog parks. Features: Arsenal Park offers a walk/bike path, and many other recreational and sports amenities. For a small fee, picnic tables, barbecue grills, softball and playing fields are available for group outings and celebrations. Features: Filippello Park features a one-quarter mile walking path and other recreational amenities; a convenient parking lot from the Grove Street entrance, and on-street parking on Arlington Street. Residents can request a permit from the Recreation Department to reserve the fields, picnic tables and barbecue grills. Features: Trees, Park Benches; Playing Fields; Lighting for Evening Activities; Tot Lot (designed for preschoolers); Restrooms located in the Watertown Town Hall. Several community events are held here, such as Faire on the Square, Outdoor Summer Concert Series, September 11th Remembrance, and Memorial Day Festivities. Location: Nearby to Whitney Hill, Watertown and Meetinghouse Hill; Whitney Hill Park is close to Moxley Playground, Saltonstall Park and Howe Park. On the south end of the park, the paths start at the end of Marion Road and where Oliver and Marshall Streets come together in a U-shape. From the north, the path comes out on Marlboro Terrace, a small street off Springfield Street. The Watertown Health Department has produced an Important Pet Services brochure that outlines the Watertown Animal Control Ordinance, and provides a list of emergency animal hospitals as well as traveling veterinarians that serve the area.